The construction industry is associated with blue-collar workers doing simple, physical things, like banging a hammer against a wall. The high-tech industry is associated with, well, nerds. You know, the kind of people who wouldn’t know a hammer from a hacksaw. But, as with most stereotypes, that’s not really the way it is. The most successful construction companies have always embraced cutting edge technology. 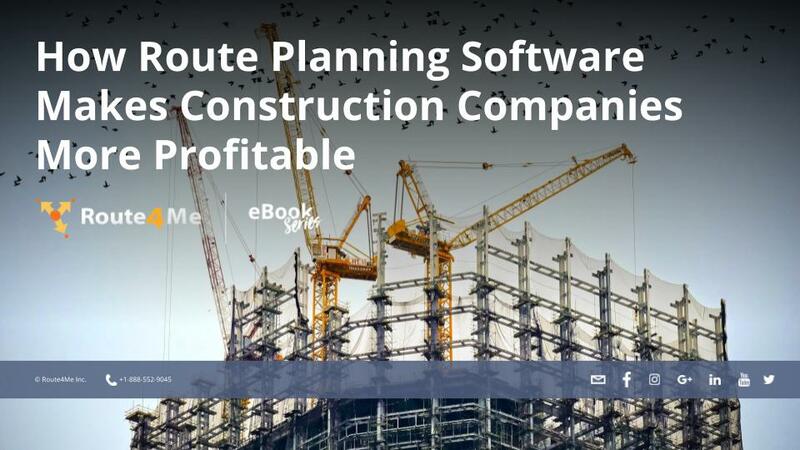 Route planning software is one high-tech tool that can really help construction companies out. Planning routes is complicated. There’s more to it than figuring out which roads your drivers must take to reach your customers. You also need to account for traffic, weather, construction, and other factors. But when you have final mile delivery software, route planning only takes 30 seconds. All you need to do is plug in the addresses of your customers, and then you’re good to go. Also, route planning software allows you to provide your fleet with more efficient routes. Your drivers will get there when you said they’d get there, so you can maintain a good reputation. Gas is one of your biggest expenses, right? Well, when you have route optimization software, your drivers won’t need to use as much gas to complete their routes. You’ll be able to reduce your expenses significantly. Optimized routes won’t do you much good if your drivers don’t actually follow the routes you give them. That’s why you must make sure the route planner you invest in has a GPS tracking feature. GPS tracking allows you to see where your drivers are and how fast they’re going in real-time. Whenever you want, you can check in on a driver and confirm that they’re sticking to their route and staying on schedule.